Arcade actions zombie shooter! How many waves until the room is overloaded? This is an action arcade shooter. Wave after wave of endless zombies makes every moment more and more stressful. It doesn't it make it any easier than every 5 waves a boss comes in to make anyone miserable! How many kills does it take to be the king of the leaderboards? Endless waves come through the giant opening in front of the main character. He has no other options but to gun down zombies in a cage-match to death! This game mode has 2 maps, with a different boss and twist to each. Never before seen in a zombie shooter.... pacifism mode?? See how long someone can survive the apocalypses without any violence. 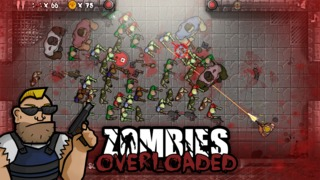 Zombies Overloaded is currently available as beta on the Google Play store and on itch.io. This April there will be a simultaneous release on Android, iOS, and PC!